President Obama blamed the Republican Party for what he called politically motivated opposition on issues. Obama promises to call out GOP "when (Democrats) extend a hand and get a fist in return"
Washington (CNN) -- President Obama tore into the Republican opposition on Capitol Hill Wednesday, blaming the GOP for what he called politically motivated opposition on virtually every issue. Democrats have been willing to incorporate Republican ideas on health care and other issues, he said, but Republicans have not been willing to do the same. Addressing a gathering of Senate Democrats, Obama promised to "call (Republicans) out when (Democrats) extend a hand and get a fist in return." Several Democrats facing tough election fights this November were given time to ask the president questions on high-profile issues such as trade and deficit reduction. Much of the president's time, however, was used to lash out at GOP tactics. Senate Republicans, he said, have tried to employ the filibuster more over the past year than in all of the 1950s and 1960s combined. The GOP's strategy has been "20 years of obstruction packed into one," he said. "If you want to govern, you can't just say no," he argued. "It can't be about just scoring points." The filibuster, he added, only works as intended if there is a "genuine spirit of compromise." The president's tough rhetoric was part of a more aggressive -- and frequently populist -- White House strategy in the wake of the Democrats' recent upset loss in the Massachusetts Senate race. GOP Sen.-elect Scott Brown's victory stripped Democrats of their 60-seat Senate supermajority and raised fears among many congressional Democrats about a potential GOP landslide in the upcoming midterm elections. The Democratic answer to the Massachusetts Senate race should not be "to do nothing" in Congress, he said. Nervous constituents want to see legislative progress, he asserted. "We should do more, and we should do so without delay," he said. In recent days -- during a meeting with House Republicans in Maryland and in town hall forums in Florida and New Hampshire -- Obama has repeatedly offered to work with GOP leaders. At the same time, he has been ratcheting up his own partisan rhetoric. "By extending an olive branch to Republicans, the president appears to be attempting to appeal to independent voters who have flocked to the GOP over the past several months," CNN Deputy Political Director Paul Steinhauser said. "But the president also needs to rally a deflated and angry Democratic base, which accounts in part for his tougher attacks against GOP leaders." Obama cited several examples of what he said was GOP legislative maneuvering motivated purely by political considerations. Among other things, he raised the recent example of seven GOP senators who backed a bill establishing a bipartisan deficit reduction commission, but then turned against it when the proposal came to a vote. He also noted that a large number of bills have been subjected to Republican-led filibusters, only to receive 85 or 90 votes once the filibuster is broken and the legislation is allowed to move to a final vote. I'm "not open to switches" solely "because it's good short-term politics," he said. I won't tolerate an "if you lose, I win" mentality. Obama urged Senate Democrats to stop listening to what he called politically oriented cable television shows on networks such as Fox News, CNN and MSNBC, and instead get out of the Washington "echo chamber." Most people "don't care about majorities and minorities and process," he said. They just want to know if their elected representatives are "delivering for me." 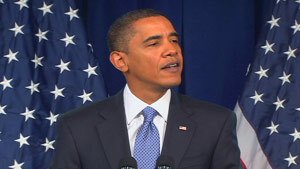 The president warned fellow Democrats that the public is often misinformed on key issues such as budget deficits. Many constituents will cite foreign aid or legislative earmarks when discussing ways to reduce spending, he said, when in reality those items constitute a minuscule share of federal spending. Balancing the budget while refusing to raise taxes and exempting entitlement programs such as Social Security and Medicare would require 60 percent cuts in virtually every other program, and "that's just not going to happen," he said. Noting that Bill Clinton left office with budget surpluses, Obama asserted that Democrats "should have credibility" on the deficit issue. But the party is "still haunted" by debates from the 1960s and '70s when the party was stuck with the "tax and spend" label, he said. CNN's Dana Bash and Alan Silverleib contributed to this report.